Imagine a Better Future was this year’s theme of Mobile World Congress America, en event attended by nearly 22,000 people, ten percent of which were CEOs. Topics centered on exploring the positive impact of mobile on people and businesses across North and Latin America, featuring discussions on public policy, innovation, media and networks. This year’s conference was significant for Haxiot in that it coincided with the announcement of our release of the Haxiot X-ON™ network and application IoT platform. The event also provided an opportunity to meet with our current and potential customers and present a live demo of our product at two locations. The LoRaWAN Live! 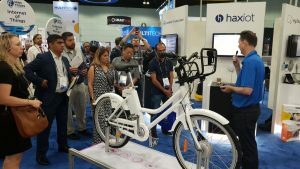 organized by LoRa Alliance featured Haxiot’s smart bike application. The demo screen displayed real time device data of GPS location, battery charge and speeds of a network of eBikes distributed in an urban area. The smart bike only took two weeks to assemble from scratch. The application proved to be 100% reliable, running non-stop throughout the MWCA event. The main Haxiot booth showcased real time data collected from our demo kit devices, which included a temperature sensor and LED light, and a range of LoRaWAN enabled devices covering smart lighting controller, smoke detector and new gateway product. The HXG3000 indoor gateway was also on display. Our team met with system integrators, network operators, IoT solution resellers and a few vertical application providers, mainly from smart lighting and asset tracking application companies. Attendees expressed to us that our device-to-cloud capability solves their biggest pain point in building robust IoT solutions. Integrating hardware, software and cloud solutions from different vendors continues to be the biggest barrier to successful LoRaWAN adoption. It requires enterprise customers to set aside large budget and build a team of engineers with a broad range of specialized skills. We’ve seen companies spend close to $1M on self-built complex systems and sometimes more than a year to make it fully functional. Additionally, all the barriers and technical issues concerning the integration are left for the customers to resolve. With Haxiot, your set up will only take weeks instead of months, giving you a significant time-to-market advantage. Also, you will have more control over your deployment cost. While many IoT platforms do process data, few also generate it in a way that is secure and at scale. In Haxiot’s X-ON™ network and application IoT platform, you will find a solution that will securely generate and process your data. If you have stopped at either of our booths at the MWCA event or have questions about how our solutions can help you grow, connect with us!